Here we have a Honda NC700 DC in Black and Burgundy with 8.7K on the clock. FSH, we have all her keys and booklets. She will leave us with a full PDI, Service, a new set of tyres, 12mth MOT and a 3mth warranty. Nationwide Extended warranties are available at reasonable prices. UK delivery from £100. SHe benefits from Oxford heated grips, A Datatag and a GIVI top box. As with Honda, the build quality and reliability is second to none. The NC packs a punch from the 700 DCT engine, which is smooth as silk and in sports mode very responsive. Very economical and comfy. Great for commuting, rides out and two up touring. All in all a really nice machine with a couple of essential extras that only add to its versatility. Ride is a friendly down to earth business with a passion for biking. Finance Available, HPI Clear, PX Welcome, Friendly Customer Service. 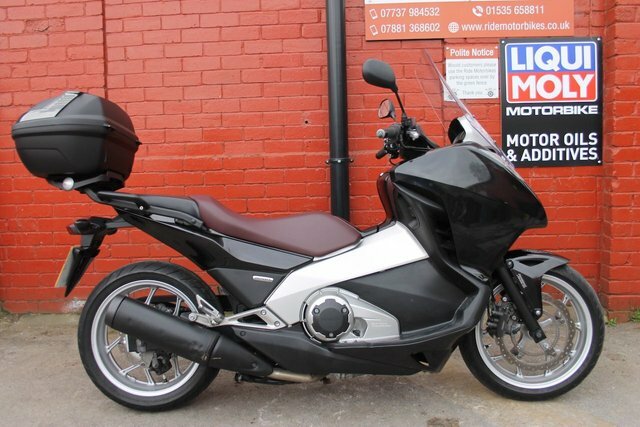 01535 658811 ***Check out our customer reviews on the website, at Ride Motorbikes Ltd Facebook page/Autotrader shop and google*** For more information about us, the bike and our stock please visit our website. The adventure starts here! Open 7 Days A Week. Ask us about Locks and Chains, Datatags, Helmets and Heated Grips. Stay warm and secure with Ride.